My24HourIncome is a Revenue Share from a legendary marketer: Drew Burton from Canada. A unique earning feature is the referral commission pool where every member with minimum 1 adpack can get a referral commission even if he has no refs, the way this works is by sharing the commissions from members without a sponsor. There will also be an affiliate marketplace where members can promote products and earn up to 75% commission, the rest of 25% goes to the adpack pool. Members will have access to free training through another Facebook group dedicated to internet marketing. Our hosting company has to tweak the servers again to accommodate the member base and prospects viewing the homepage and site content. We are seeing 4000 to 6000 members on the site at the same time roughly now and as you can see our Alexa rank has jumped over 150,000 spots in the past 10 hours!!! Drew has been a marketer for about 7-8 years i believe and he's a top leader in the RevShares he joined. His posts on Facebook are very engaging with tons of comments, likes and shares. Almost every page on My24hourincome has a video by him explaining it. And every change is announced with a video for further detailing. Note: changes are not set in stone while in pre launch, they are open for debate on the Facebook Group. There will also be affiliate products that members can promote and earn up to 75% commission, the rest of 25% goes to the adpack pool. 5684 members in less than a week. Admin stated he plans to only allow repurchase after withdrawing earnings first, so no inside compounding. Bitcoin is going to be a payment option as well. Note: the referral link format have changed so make sure to use the new one. SSL certificate was added for https connections. 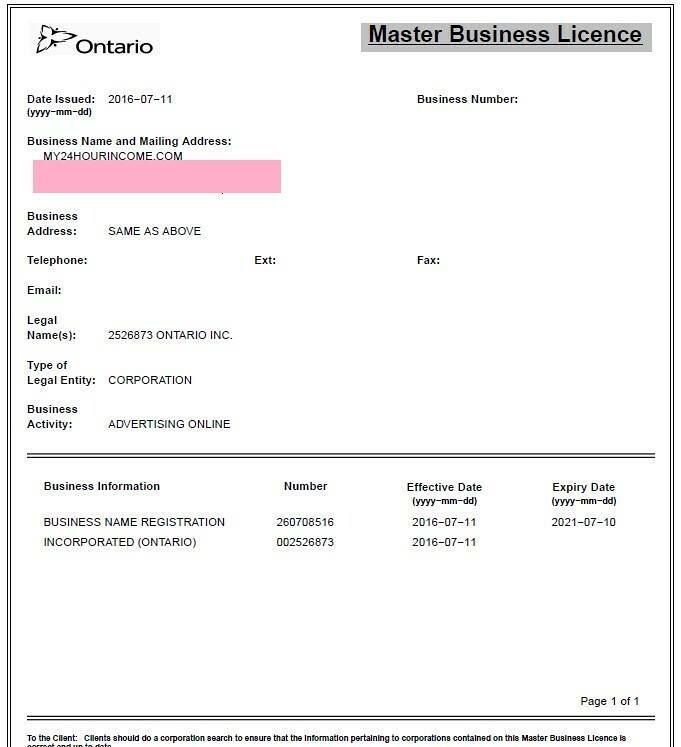 Legal Name(s): 2526873 ONTARIO INC. Launch date was postponed to 20th august. The current server costs $1000 per month so it couldn't handle 6,000,000 views a day so it will upgrade to a $10000 per month. New $75 adpack with 130% maturity.